This is a great overnight stop in Francistown whether you are there for business or just passing through en-route to Nata, Kasane or Maun. We last stayed there in July 2015. Well designed rooms, we stayed in the chalet, that was beautifully done. When booking request this room. 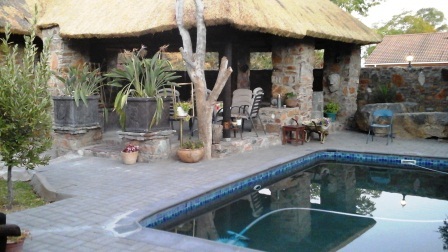 New Earth Guest Lodge is located in a residential area of Francistown, not to far from the main business area. What really makes this place so amazing is the unpretentious home- from- home feeling the moment you step through the front door. The owner has an instinctive touch of understated grace that touches her home; her gentle smile fills each room like a quiet presence and her love for books she does not even attempt to disquise : A book on the dining table, another open one in the kithen and magical bound worlds on her bookshelf speaks more than a thousand fancy publicity or decorating stint any other guest house ever dare…. We were reluctant to leave after our short stay there but the address is on our Gps under favourites.